with steeply rounded sides flaring to a rolled-out lip and forming a continuous concave surface on the interior, standing on a solid ring foot resembling a jade bi-disc, with a clear glaze of pale greenish tint inside and out, showing a cluster of darker ‘tear marks’ on the underside, the recessed center of the foot also glazed and with a typical small thumbnail mark under the glaze on the straight outer side of the foot, the knife-pared wide flat base of the foot unglazed revealing the pure white porcelain body. White porcelain bowls of this classic early form were made at both the Xing and Ding kilns in Hebei. The present example shows all the characteristics of Ding ware, including the ‘tear marks’ and pale greenish tint in the glaze, the mark left by the potter’s thumbnail on the exterior edge of the foot, and the orange translucency of the body revealed by transmitted light. For a scholarly discussion of this type of early white porcelain bowl with an illustrated guide to the distinguishing characteristics of Xing and Ding examples, see Fan, “Early Ding Wares in the Shanghai Museum,” Orientations, Vol. 22, No. 2, February 1991, pp. 48-50. A very similar bowl in the Beijing Palace Museum is illustrated in Zhongguo taoci quanji (The Complete Works of Chinese Ceramics), Vol. 6: Tang, Five Dynasties, Shanghai, 2000, p. 198, no. 223, described as Dingyao of the Five Dynasties in the full description on p. 277. Compare also the similar bowl of smaller size excavated at the site of the Ding kilns at Quyang county in Hebei, now in the Hebei Institute of Cultural Relics, illustrated in Dingci yaji: Gugong bowuyuan zhencang ji chutu Dingyao ciqi huicui (Selection of Ding Ware: the Palace Museum’s Collection and Archaeological Excavation), Beijing, 2012, pp. 60-61, no. 16. 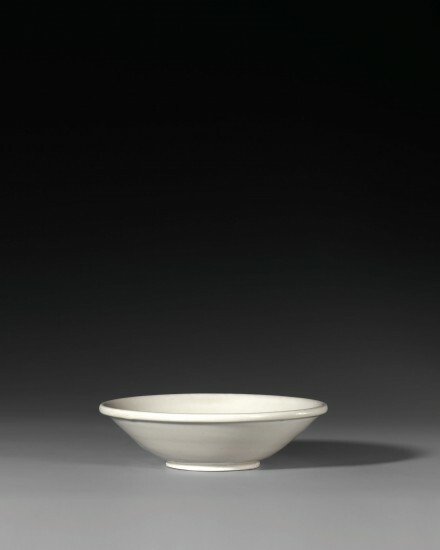 This form of white porcelain bowl was among the most popular early tea wares in China and also gained wide popularity on ‘Silk Road’ trade routes. Chinese white ware bowls of this distinctive form have been found at several 9th-10th century archaeological sites in North Africa and the Middle East. They are often referred to as “Samarra type” bowls because of their discovery during excavations early in the 20th century at Samarra in Iraq.